Last week in this post I mentioned that I had moved the chair from the office desk. I addition to the arms banging the desk I did not mention that the finish of the upholstery was all cracking a flaking. The wear on the front edge of the seat was so bad that I had previously made an elasticised fabric cover for the seat and I noticed that the back was showing the same tendencies. It was definitely time for the chair to go. I was not hopeful of finding a new home for it but placed an ad on the local Facebook Buy, Swap, Sell page give it away. Happily, it was just what someone wanted so it has gone. The dining chair was not a suitable long-term replacement so yesterday we looked for a replacement at Officeworks. We were a bit like Goldilocks trying out all of the various options which ranged from very lightweight and uncomfortable to positively luxurious and everything in between. In the end this is what we chose. It is sturdy, comfortable and relatively compact. It fits neatly under the desk and I am very happy with our new chair. Well the desk is all assembled but not without a hiccup or two. This morning we opened the box containing the hutch and it was the wrong colour!! Yes, we had managed to pick up the wrong one. So, it was off to IKEA again which really threw our plans for the day into disarray. The traffic was a nightmare on our way home but we finally made it back and set about assembling the hutch. Here is the final item all completed and in position. It is shorter and narrower than the old table so creates a bit more space in the room. 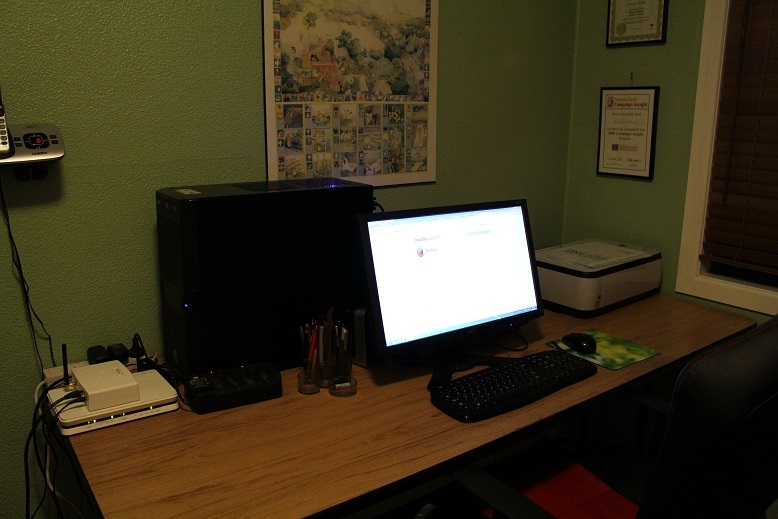 I have been able to conceal almost all of the cables behind the desk which is much neater than before. 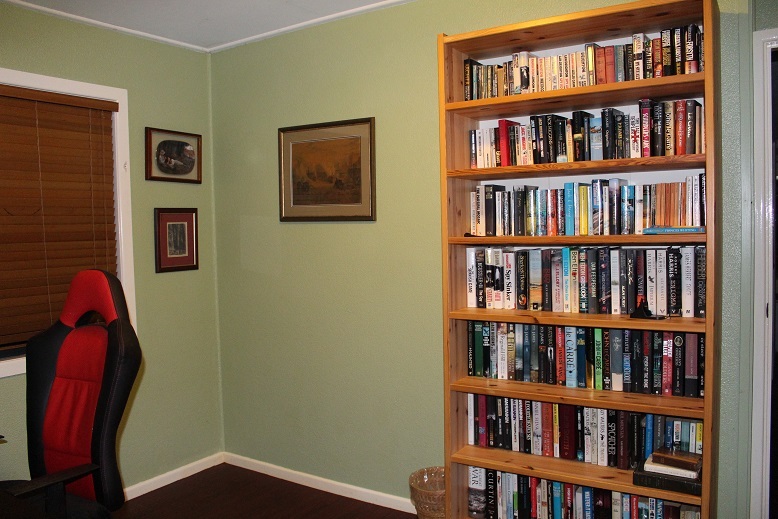 I moved the pictures that were above the old desk to the other side of the room now that the second bookcase has gone. Now I need to find a suitable chair to place in the corner to create a comfortable reading nook. I am really pleased with how this room has been altered and redefined. I have some plans for minor alterations to a couple of other rooms in the future. No doubt, I will post about those when they happen but please don’t hold your breath. I have just checked the date and realised that it is 10 days since my last blog post. I have been busy – in that time my mother has come home from hospital after having undergone heart surgery, I have attended a gathering of my extended family which I organised to celebrate a milestone from my grandfather’s life and been away for a work conference for 2 days. That has all been in addition to running a household and holding down a full-time job. There will be some blog posts about some of what I have been doing,but that is enough of my excuses for the moment. GMan and I both had a day off today and we decided to make a round trip of over 200km to IKEA to buy a new desk for our home office. I had searched online for either a new or second-hand desk and the one we bought was definitely the best to suit our needs. 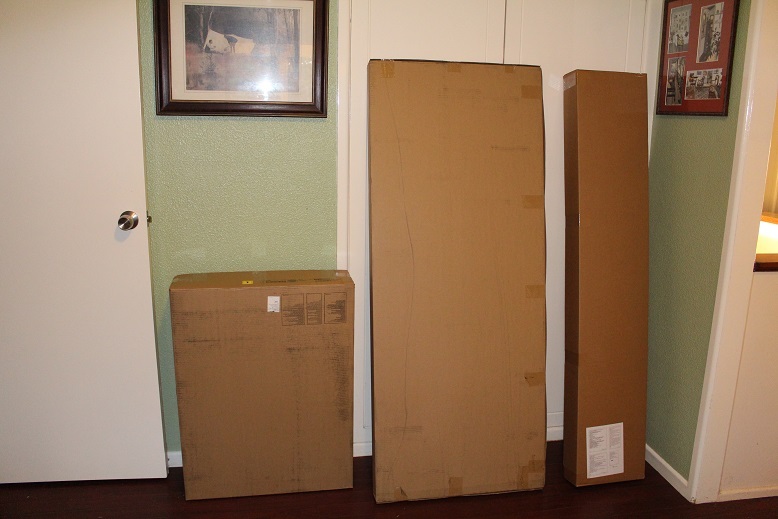 We arrived home this afternoon with 3 large packages. GMan and I have spent several hours assembling the desk. We are very happy with how it has turned out so far. It is currently sitting in the middle of the office. Tomorrow we will move all of the stuff of the existing desk and position the new one in its place. 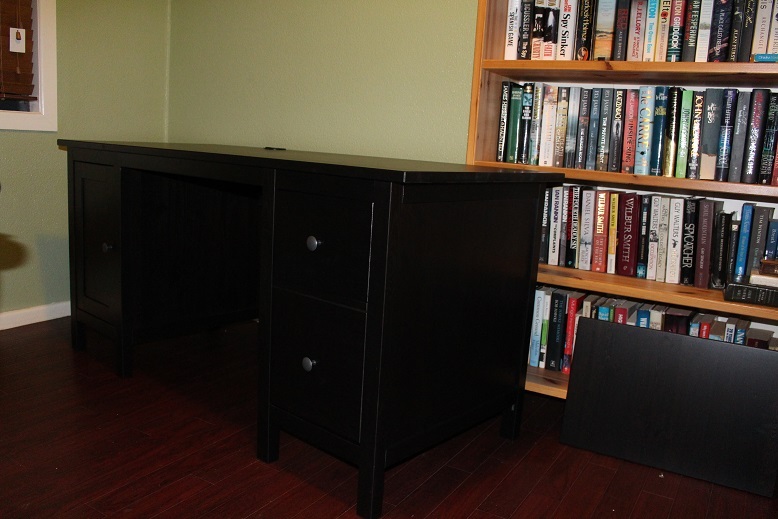 The next step will be to build the bookcase/hutch section which attached to the desk. 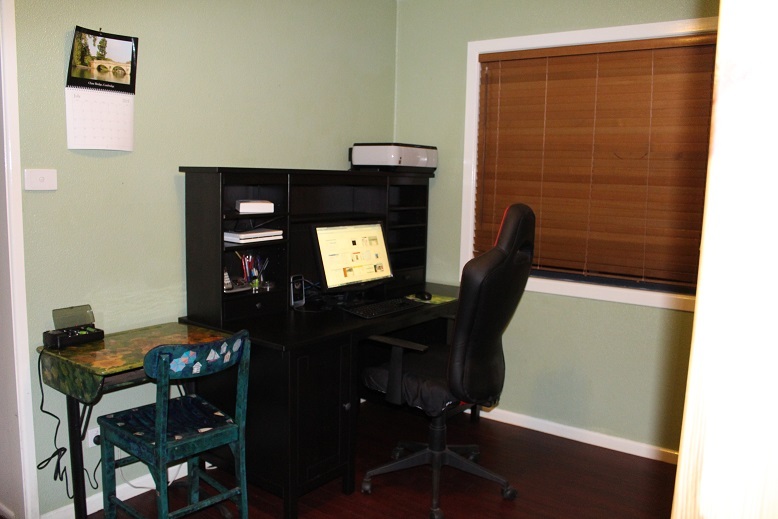 Watch out for tomorrow’s post in which I hope to show you the completed desk and revamped office/library area. I have not written much lately about my decluttering efforts but that does not mean that it isn’t happening. Today we finally got around to collating the documents we needed to have our tax returns done. The Duke scanned these and emailed them to the accountant. On thing led to another and I ended up cleaning out the filing cabinet as well as sorting and tidying the shelves in the cupboard. 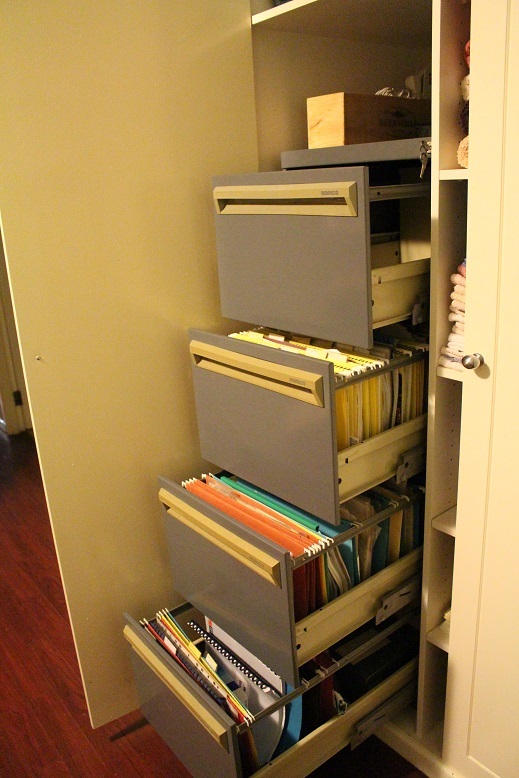 We have one completely empty drawer in our 4 drawer filing cabinet and the others are sorted and tidied up. 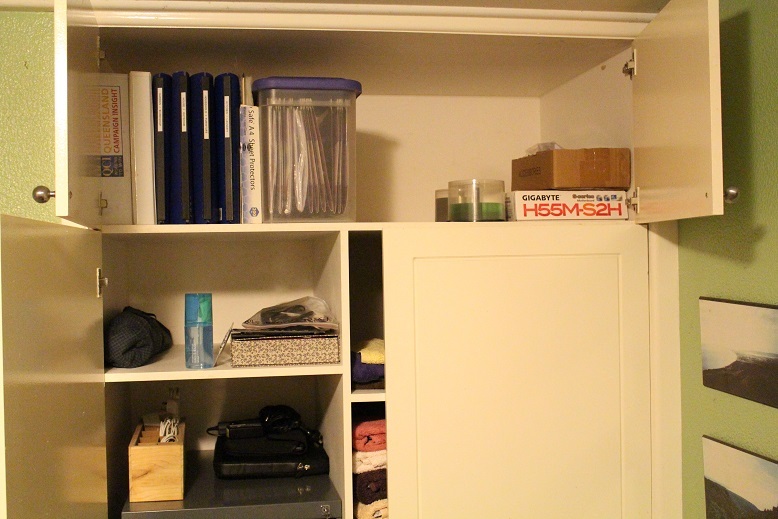 There is a lot less stuff in the top cupboard. It is difficult to see but you will have to believe me when I say that we got rid of quite a bit of stuff. All of the paper has been recycled. Some went in the recycle bin but most was torn into strips and added to the the leaf litter in the new raised garden bed. We topped it with a layer of mulch and watered it in well. This will break down over time. Paper is one of the most difficult types of clutter to keep under control so it requires constant work to win the battle. There will be more to do but I feel that we have made some real progress today.